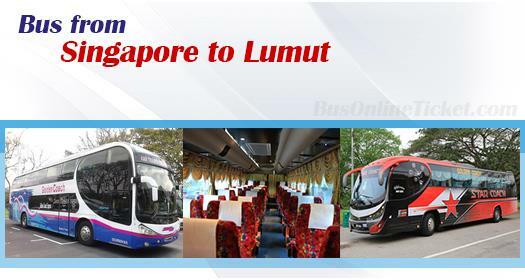 Bus from Singapore to Lumut is an important bus route serving for people who are working in Singapore but their hometowns are from Lumut, Sri Manjong, Sitiawan, Ayer Tawar, Kampong Koh and Teluk Intan. Since there is no train service and flight service to these cities, bus becomes the only option for them to go back hometown from Singapore. The bus fare for bus from Singapore to Lumut, Sri Manjong, Sitiawan, Ayer Tawar, Kampong Koh and Teluk Intan is ranging from SGD 44.00 to SGD 60.00, depending on the coach operator. During festive season like Chinese New Year, the bus fare could go up to SGD 100.00 – SGD 130.00. Duration for bus from Singapore to Lumut, Sri Manjong, Sitiawan, Ayer Tawar, Kampong Koh and Teluk Intan usually takes about 7-8 hours. The coach will first arrive at Teluk Intan to drop off passengers, then it will continue the journey for another 1 hour to Lumut area. Before terminating at Lumut, the coach will drop off passengers at Kampong Koh, Sitiawan, Sri Manjong. Kampong Koh, Sitiawan, Sri Manjong and Lumut are nearby cities with just 5-10 minutes driving distance away. Most coaches leave Singapore from Tuas checkpoint, and provide a meal stop and wash room break at Yong Peng food court. Working in the fast pace Singapore environment, user-friendly online booking service in BusOnlineTicket.com is convenient to passenger buying ticket to go back to hometown. For those who do not have credit card and internet banking, they could reserve the ticket online by select Singpost and SAM payment option. They will be given the booking reference number after online reservation. Then they just need to proceed to nearby Singpost and SAM machine to make payment by quoting the booking reference.